Press photo of popular adventurer-author-filmmaker-big game hunter Martin Johnson and his wife, Osa Johnson. Both were aboard the Boeing 247D airliner that crashed in the fog  and in a snowstorm, if the Associated Press story below is to be believed  on a mountainside southeast of Newhall on Jan. 12, 1937, shortly after 11 a.m.
Martin Johnson died the next day from injuries sustained in the crash; Osa Johnson survived. A total of five people died; only one was killed on impact. After Martin Johnson, three others would succumb to their injuries. They were still listed in critical condition at the time of the earliest news reports, like the one below. 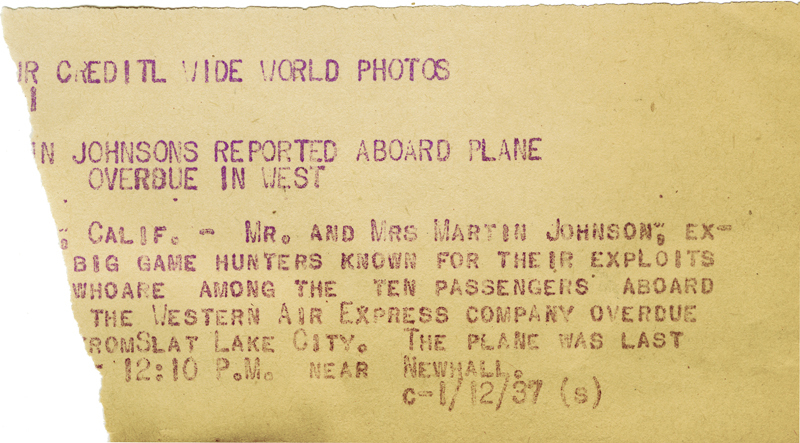 Torn original copy of photo cutline is dated Jan. 12, 1937, and carries word that the famous couple was aboard the aircraft, which was last heard from at 12:10 p.m. (time zone unknown) and whose arrival at Burbank was overdue at the time. Photograph by Wide World Photos Inc.; print and cutline from the archives of The Baltimore Sun, purchased in 2012 by Leon Worden for the Santa Clarita Valley Historical Society. See photos of the plane crash here. The Associated Press wire report of Martin Johnson's death, carried under a banner headline in many American evening newspapers on Jan. 13, 1937, follows. LOS ANGELES, JAN. 13  (AP)  Martin Johnson, African explorer who followed jungle trails with impunity, died today the victim of an accident of civilization, the crash of an air transport plane which killed one other person and injured 11. The bald, keen-eyed Midwesterner, whose exploits were known to thousands through adventure books and the motion picture screen, succumbed in a hospital to multiple fractures suffered in the disaster which overtook a Western Air Express ship in a snow storm yesterday. Johnson's wife, Osa, his companion on many forbidding quests of game and story material, escaped with a fractured knee. "Where is my husband?" was her first cry when rescuers came upon the littered wreckage of the plane. He lay not far away with fractured legs, broken jaw and other injuries, calling incoherently for aid. It was the climax of 26 years of life they had spent together since their marriage at Chanute, Kas., a life which had embraced many dangers of the wilds. But Johnson had figured that the jungle was safer than a city's streets. At Salt Lake City during a stop on the flight westward to fill a California speaking engagement he said: "Why I almost got killed by a taxi this morning." James A. Braden, president of a Cleveland ink company, was crushed to death between two seats when the plane pancaked on a fog-shrouded mountainside 15 miles from Union Air Terminal, its destination at Burbank on a flight from Salt Lake City. Co-pilot Clifford P. Owens and A.L. Loomis of Omaha, Neb., a passenger, were critically hurt, and none of those riding in the big all metal craft escaped without some injury. While snow piled up on the damaged wings and fuselage of the airliner, on a ridge 100 yards below the Los Pinetos ranger lookout station, two governmental inquiries were set in motion in an attempt to determine the cause of the disaster. It was the fifth major airliner accident in the United States in the last 30 days. Johnson, the big game hunter, had suffered a concussion, fractures of both legs, multiple fractures of both jaws, a fractured nose and severe shock. He was brought to the hospital early today after receiving emergency treatment last night in a ranger lookout station 100 yards from where the Salt Lake City-Los Angeles airliner pancaked. 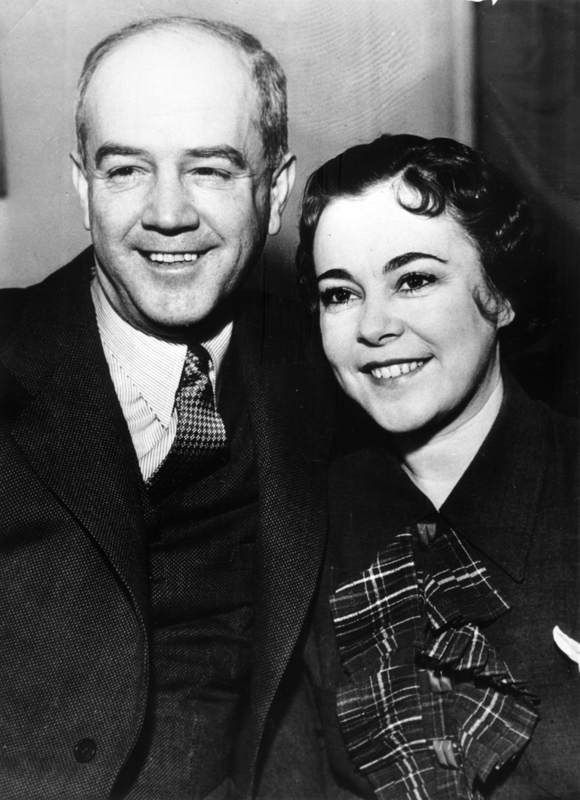 With his wife, Osa, his companion on many African safaris with movie cameras, Johnson was on his way to fill a series of lecture engagements in Southern California. Johnson was 52 years old, a native of Rockford, Ill. His travels that took him to the far corners of the earth started when he was only 14 years old. He worked his way to England on a cattle boat then and returned home as a stowaway after a book about the voyage. As a cook he sailed the South Seas with Jack London on the famous vessel "Snark" and later wrote a book about the voyage. In 1910 he married 15-year-old Osa Helen Leighty of Chanute, Kans., and thereafter the Martin Johnsons became a traveling team, taking motion pictures and guns into the darkest jungle corners. The Johnsons made six trips around the world, hunting big game, taking motion pictures of strange lands and customs, and getting together material for books and lectures. 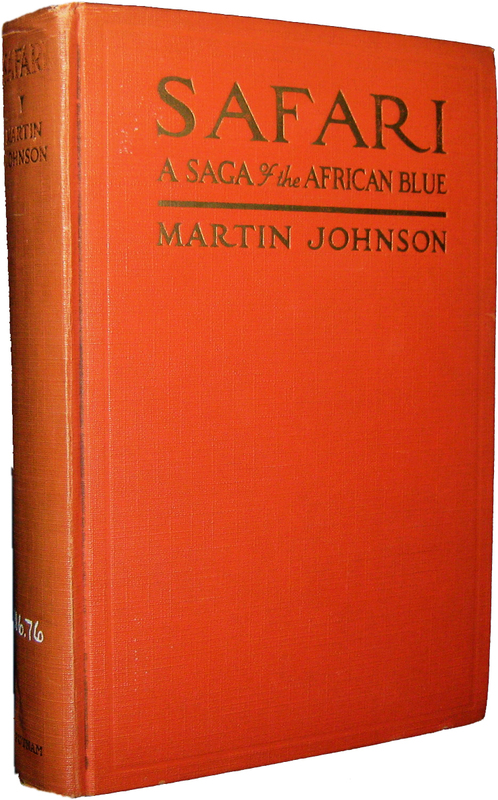 Among the books written by Johnson are "Through the Sough Seas With Jack London," "Cannibal Land," "Camera Trails Through Africa," and "Safari." Using a six-mule team and wagon, rescuers toiled all night to bring out the injured during a snow storm. The big ship struck a foothill in murky weather ten miles from its terminal destination, rolling along a slope for 20 feet. A tragic picture greeted first arrivals at the crash scene, four miles from the Olive View Sanitarium  a semi-conscious co-pilot mumbling incoherently into a radio no longer working; every occupant "piled up on someone else." The scene was detailed by Gardner, who said he found Pilot Lewis in the mail compartment, pistol in hand. "His leg broken, he was looking out of the compartment, a gun in his hand," Gardner said. "He had just fired a shot to direct rescuers to the scene." [Gardner continues]: "I pulled open the cabin door. My eyes fell first on the dead man, James Braden. His body had fallen over Mrs. Osa Johnson and she was asking for someone to help lift him aside. She apparently was suffering from a broken leg. "Most of the passengers were conscious. The seats were all smashed and everyone seemed to be piled up on someone else. "I recognized Martin Johnson from pictures I had seen of him. He was delirious and was screaming from pain and shock. "The stewardess was the heroine. Although suffering from a broken ankle, she limped about trying to help out all the others and cheer them. "Everyone was quiet and composed except Johnson, who was still in his delirium. They all took the tragedy bravely. When other rescuers finally arrived, they all seemed a bit cheered." "The pilot told me the crash took place at 11:10 a.m."
D.E. Spencer, Chicago, head injuries; critical condition. Pilot William W. Lewis, Glendale, Calif., fractured leg. R.T. Anderson, who booked passage through an Atlantic City, N.J., traveling agency, fractured leg. T. Tillinghast, Hartford, Conn., sales manager of Pratt and Whitney, airplane engine manufacturers, fractured ankle. Miss Lita James, Los Angeles, uninjured. Arthur S. Robinson, Rochester, N.Y., possible fractured ankle. "There's an airplane crash just outside the window. I heard a great crash and then the cries of many persons." "We had no warning that anything was wrong. We were riding along very smoothly. Suddenly the plane began to drop  drop. Then there was a terrible crash."